Pig Farming In Iowa Means Dirt Under Your Fingernails And A Strong Sense Of Pride The hours are long. The work is hard, and dirty. 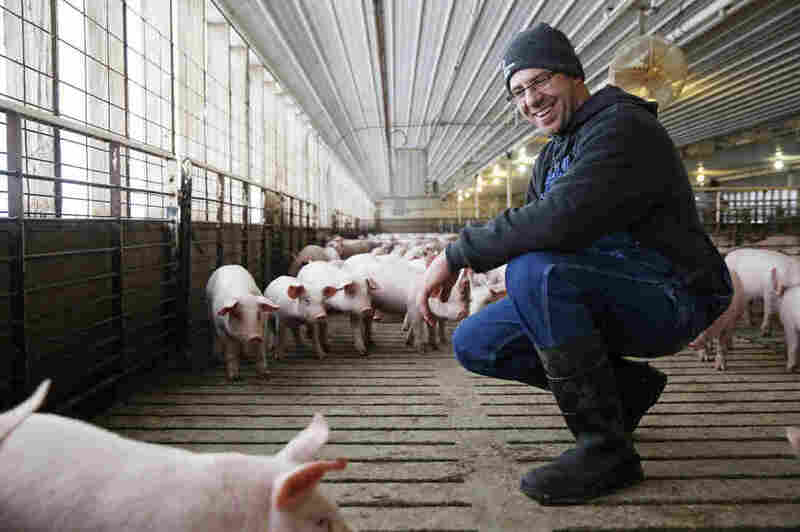 But this pig farmer in northeast Iowa loves what he does. (Top) Ryan and Dawn Kress with their youngest daughter Reagan. 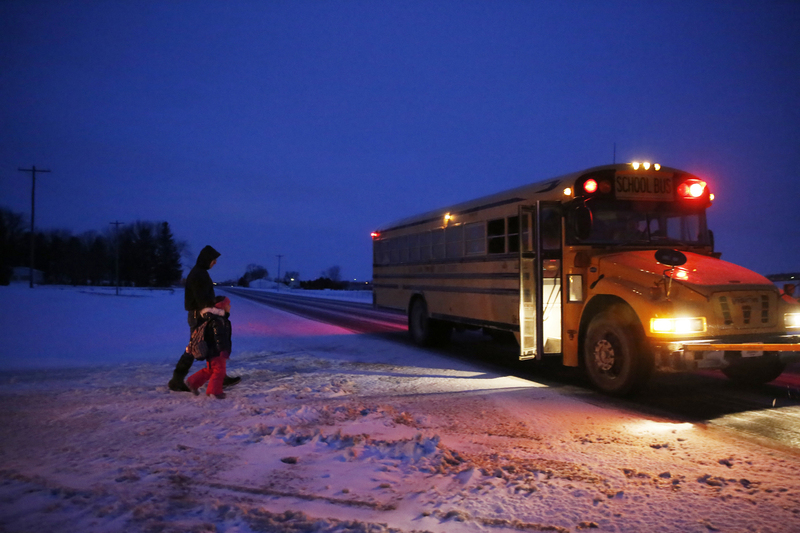 (Bottom left) Kading, 5, gets ready for school. (Bottom right) The girl's artwork on the wall in the Kress home near Independence, Iowa. There, we meet up before sunrise with Ryan Kress, 35, a pig farmer and father of two young girls, Kading, 5, and Reagan, almost 3. Ryan walks his older daughter, Kading, to her school bus at the end of the driveway. In the early morning darkness, Ryan kisses Kading, bundles her onto her school bus to preschool, says goodbye to his wife, Dawn, and climbs up into his Ford F-250 pickup to go check on his pigs. "A lot of the work and things that we have to do aren't real glorious," Kress says, "and you're gonna get dirt under your fingernails, and it's not cut out for everybody. But it's what we do, and we're proud of it." As we drive through stubbly cornfields, dusted with snow, we spot an impressive bird flying low across the icy road just ahead of us. "Bald eagle!" Kress says. "They're pretty common around here. But it's still a pretty amazing sight, just to see 'em." Top) Ryan Kress inspects the youngest pigs. They're about 35 pounds each, with pink snouts and ears and white coats. (Bottom left) Suiting up in a pair of denim overalls. (Bottom right) Kress records information after each visit. Kress studied finance in college, and figured he might be an investment broker. 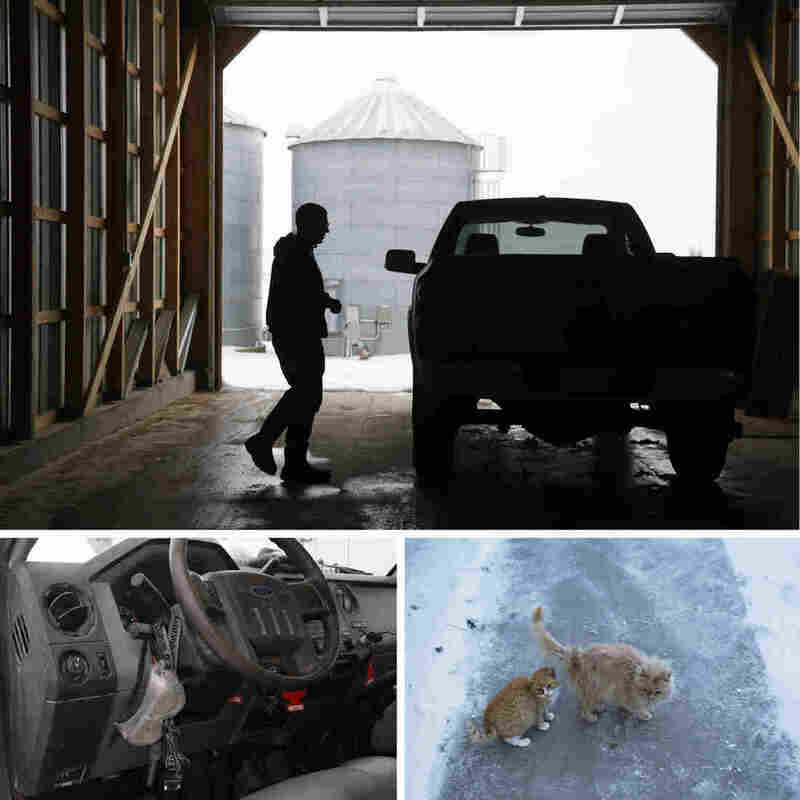 But when a farmer back home offered the chance to join a partnership in a grain and livestock farm, he jumped. Now, they market 25,000 pigs a year, raising them from three weeks up to market weight: 280 pounds. They also farm about 2,000 acres of row crops: corn and soybeans. Ryan's first stop of the day is to check on the youngest pigs: about eight weeks old. I climb into a disposable biosecurity suit and plastic booties to keep from spreading any infection. Kress checks the pigs for signs of weakness or respiratory distress. "[We] try to make eye contact with every animal, every day," he says. Inside the barn, we're greeted by 1,300 pigs who trot around the slotted concrete floor in a frenetic mass. They're about 35 pounds each, with pink snouts and ears and white coats. "This is a nice group of pigs," Kress says, as he surveys the swine. "When I get a group of pigs like this, I say they're cookie cutter pigs. They're pretty much all the same. We take a lot of pride in a nice group of pigs like this. It's what we strive for." Kress moves through the pigs, checking for any that show signs of weakness or respiratory distress. "[We] try to make eye contact with every animal, every day," he says. Winter can be hard on a young pig, and pretty soon, he notices one which is lying on the ground, not moving. "There's one that didn't make it," he says. 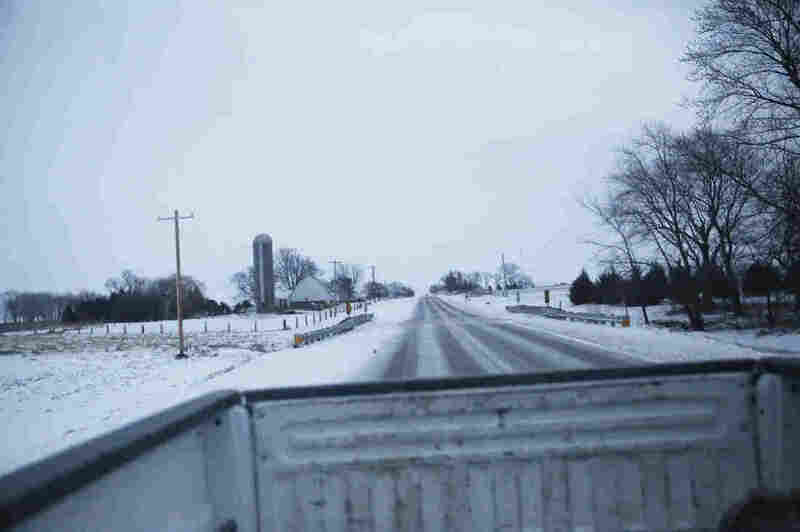 Farms near Independence, Iowa fill the view out the back of Ryan Kress's truck. Kress scoops the piglet up and takes it out to the frozen compost pile. Eventually, it will be returned to the fields as fertilizer. "It's not one of the fun parts of the job, but it's natural, right?" Kress figures this farm has about a 3 to 5 percent mortality rate. Now, a word here about smell. For the uninitiated, it is pungent in these barns, to put it mildly. Kress is used to it, of course, and he's even able to distinguish each age of pig by its distinct odor. His wife, Dawn, can, too. "My wife and I laugh," Kress says, "'cause she's gotten to the point where she can predict which group of pigs I've been in, just by the way I smell." Back home, he has his own separate laundry machines to clean his work clothes. Ryan Kress says he's not a super-political guy, but he's excited to see changes under Donald Trump. He'd like to see fewer regulations on farming, he points out that agriculture needs immigrants for its labor force, and he wishes Trump hadn't been so quick to abandon the Trans-Pacific Partnership trade deal. (Top) Ryan Kress can't imagine living anywhere else but right here in Buchanan County, Iowa. (Bottom left) Gear — like this headlamp and goggles — fill much of Kress's Ford F-250 pickup truck. (Bottom right) Barn cats outside the Kress home. He tells me that pork producers were looking forward to a huge export opportunity in Asian markets. "I read the other night it could have been the biggest deal-maker for the pork industry in history," he says. "Hopefully (Trump) will come up with something better, or as good." At the second barn we visit, an American flag flutters out front in an icy wind. 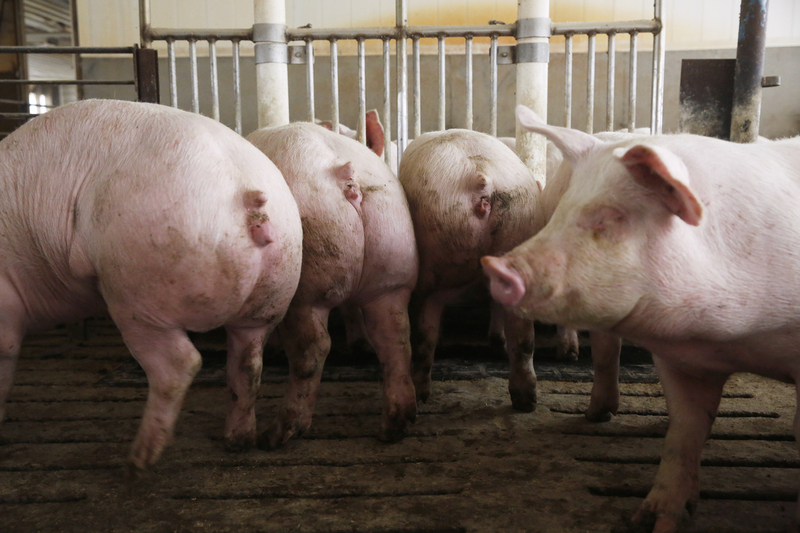 Inside are hundreds of older, bigger pigs, about 120 pounds, or halfway to market weight. But somewhere in that porcine mass, we spot one pig who's tiny. "He's just a runt," explains Kress. The hours are long. The work is hard, and dirty. But Ryan Kress says there's pride in a solid day's labor. "That's Wilbur!" I offer, thinking, naturally, of E.B. White and Charlotte's Web. Kress nods. "That's Wilbur." Ryan Kress can't imagine living anywhere else but right here in Buchanan County, Iowa. The hours are long. The work is hard, and dirty. But there's nobody telling him what to do, and there's pride in a solid day's labor.